The T-64 and T-80 utilize the same type of an autoloader to arm their 2A46/M mainguns. The latest autoloader models allow sustained fire with over 8 reloading cycles per minute. The rounds in the autoloader are stored in a carousel, with the main rounds horizontally with their fins outwards, and the charges placed vertically on top/outside of the main rounds with their stubs upwards. During loading, the main round is first raised almost to the vertical position and then moved into the breech in a single arcing movement, while the charge is moved to the same line by turning it horizontally around the stub base and raising it. Both parts of the round are then rammed by a single ramming cycle. This is marginally faster, and this is why T-80 MBTs have a slightly higher rate of fire than T-72 MBTs. What makes T-64-style autoloader notably faster than that of T-72 is the presence of 'sequence' mode. When it is enabled, the loading mechanism continuously loads the rounds of the same type without any gunners intervention. In addition, the rotation of the carousel to get the new round is done immediately after the previous round has been loaded, in parallel with the firing procedure. This allows to perform all the blocking loading operations in under 5 seconds. T-90 has received similar advancement in autoloader logic. 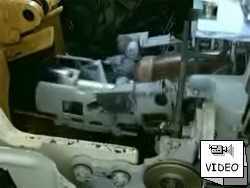 Advances in the autoloader design along T-64 and T-80 line also include the reverse rotation of the carousel thus allowing much faster cycles when the magazine is partially depleted. operation and occurs in the beginning of the loading cycle.